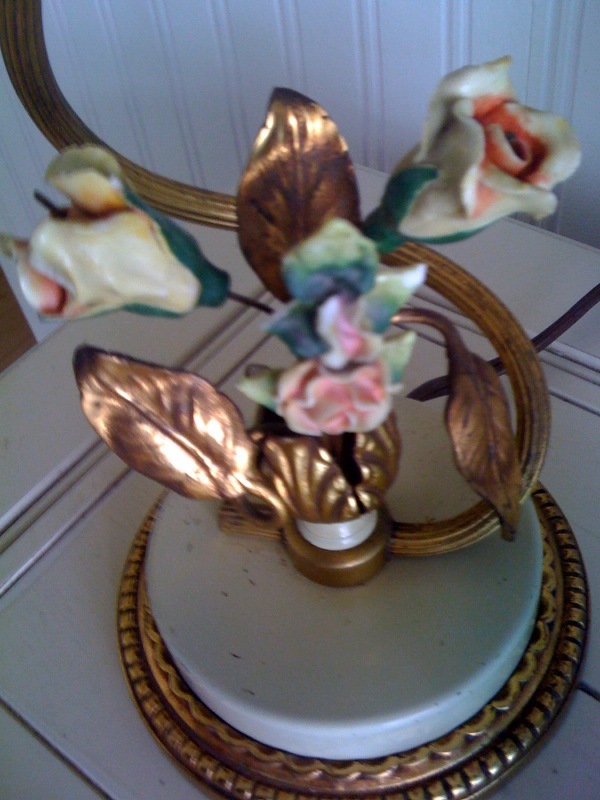 I just came back from Martha's Vineyard with a pair of sweet vintage table lamps. and sweet little porcelain flowers with metal gilded leaves. 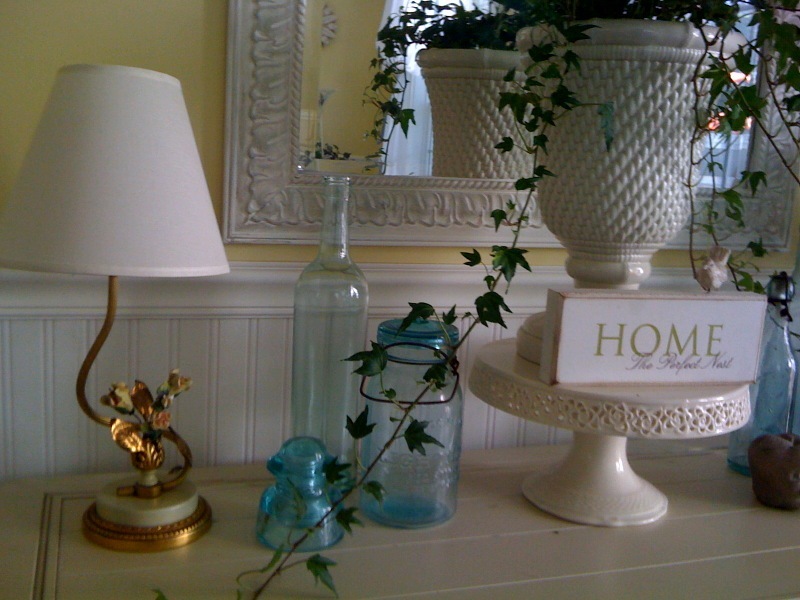 but right at home on my dining room sideboard. A closeup of the painted detail. They came from this funky antique junk shop in Vineyard Haven. Sitting on the counter, getting ready to travel to their new home....$25/pair! What a deal! I also picked up bamboo bangles and a beaded bangle that reminded me of Indian style moccasins. I put some basic off white linen shades on them. These little darlings are a delight! These are so sweet. Don't you just love it when you come across something so perfect and at such a great price? Your lamps look great in your dining room! Those are fabulous!! What a wonderful purchase too. What lovely little lamps. 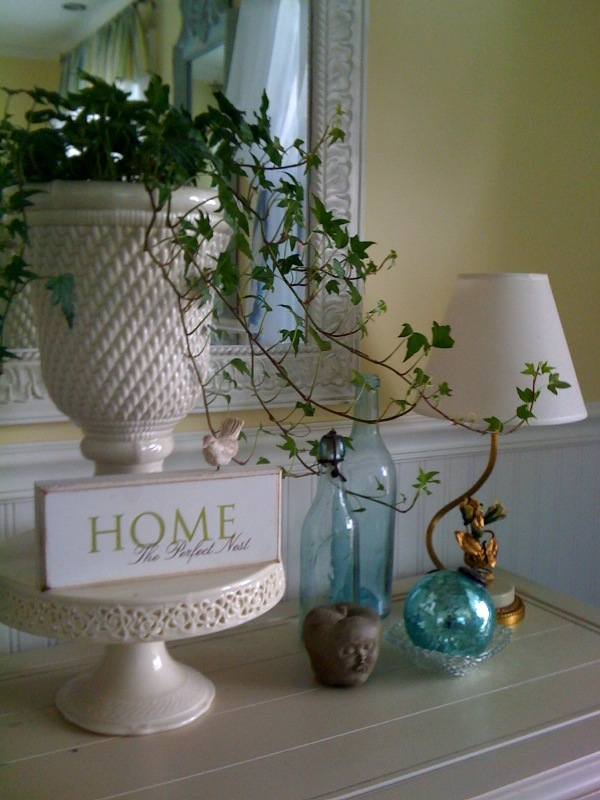 They are dainty but look so pretty with your vignette. Love the lamps...love Martha's Vineyard!! 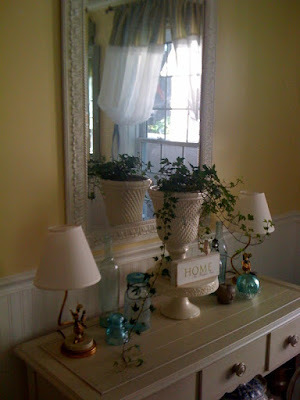 LOVE those darling lamps! They are so adorable! Sounds like that was a great shop for some finds and good prices too! Your display is very charming as well. Marthas Vineyard sounds fantastic! Lucky you! I just love special little lamps like yours. The tiny little flowers and the shape is just the sweetest. You just can't find lamps like the vintage ones anymore. I'm so glad that you found those. They really do look right at home on your table. I love all of your new finds! I’m sure a lot of work went into making those fun bracelets. I haven’t been to Martha’s Vineyard, but I’ve drooled over photos in books. My sister lives in Boston and has a home in Newport that I’ve have the pleasure of staying at. Once my daughter gets settled I intend on visiting more often. My parents are from Maine so even though I grew up in Colorado I’m a Yankee at heart. Hopefully, I will be returning to regular blogging soon. I’ve missed it, but wanted to keep Heather’s story up until we found a donor. All I can say is thank goodness for the modern age we live in. Also the donor’s wife is a blogger and told me it was fine to talk about them so I modified my post with their information. Take care. I would have fallen in love with them too! 2 for 25? What a bargain, especially in MV! Such pretty lamps. Happy they found a place in your home where the work that went into making them will be appreciated! Amy, so glad you are home safe and sound, did the doggies get to go too? So wonderful that you were able to spend time with your parents, AND get to shop, and those lamps were quite the find for, what?, $25 bucks is all? Darling!Love the flowers on them. Hope your having a great start to your week so far, take care and hope to hear from you soon!